Tip #2: Expect to get lost on the way! The roads in Virginia and West Virginia twist and turn and go strange ways at intersections. Don't be surprised when you get lost. Leave yourself some extra time to cover getting lost. Tip #4: You'll know you are lost when you see a road sign that's not supposed to be there. (For example, you are supposed to be on U.S. 52 North and you unexpectedly end up on U.S. 19 South.) When this happens, don't panic. Stop and ask for directions. You are among some of the friendliest people in the country, and they are always glad to point you back in the right direction. Tip #5: After you've been pointed in the right direction, you may get lost again. Sometimes it takes two or three times to find the true right direction. Coalwood is shown with the red star. 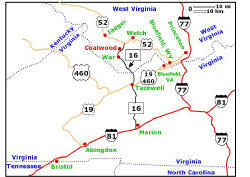 The road connecting Marion (Virginia), Tazewell (Virginia), War (West Virginia), Coalwood (West Virginia) and Welch (West Virginia) is a state road in both Virginia and West Virginia: VA 16 and WV 16. The gold-colored road running from I-77 to Bluefield, Keystone, Kimball, Welch and Iaeger (all in West Virginia) is U.S. 52. This is a good map for driving. We give directions from Nashville, Tennessee, because this route takes you by the locations where the movie October Sky was filmed. In addition to visiting Coalwood in person, you might want to visit some of the filming locations. Take I-40 from Nashville to Knoxville and beyond. East of Knoxville, I-40 merges with I-81. You will pass through two tunnels on I-77. The second tunnel is the border between Virginia and West Virginia. Immediately after exiting the second tunnel, take exit 1 and follow the signs for U.S. 52 North to Bluefield. Be sure to watch the U.S. 52 North signs carefully. It takes a rather circuitous route through Bluefield. Follow U.S. 52 North until it gets to Welch. At Welch, the road bears to the left and goes around Welch. Continue on U.S. 52 North for about two more miles. Take WV 16 South to Coalwood. Take the VA 16 exit at Marion, Virginia. Follow VA 16 to Tazewell. This is a very scenic road with lots of mountains and hairpin turns. Vehicles over 35 feet in length are prohibited from using VA 16 for most of the way between Marion and Tazewell. Once in Tazewell, try to follow VA 16 North. This is a little hard to do, and you may have to ask for directions. Follow VA 16 North into West Virginia. Here the road turns to WV 16. However, the state road signs in Virginia and West Virginia look the same, and you probably won't know you've crossed the border. Follow WV 16 into War, and then on to Caretta, Coalwood and Welch. Exit onto U.S. 19 at Abingdon, Virginia. Follow U.S. 19 to Tazewell, Virginia. Once in Tazewell, take exit 2 (VA 16) and head north towards Bishop. Once, you arrive in Coalwood, you are pretty much on your own. Be sure to study this page in advance and be familiar with the sites you'll want to see. There is also a map near the top of that page that you'll want to print out. Sadly, many of the historic buildings in Coalwood and surrounding areas have already been demolished: the Big Store, the Clubhouse, the Apartments, Big Creek High School. More will probably follow, so the sooner you visit the better. On our trip to Coalwood, we were lucky enough to find someone who volunteered to be our tour guide. If it's a nice day, talk to the people who are outside, or stop by the Coalwood store. If you do find a tour guide, be sure to give them a generous tip. This is a very poor region of the state, and money to pay bills is always appreciated. $25 per hour is probably a good minimum, but use your own judgement.